the worst movies I ever seen!!! Sit back and enjoy this contemporary Screwball Comedy! They don't make screwball comedies like they used to, but this one was pretty good. 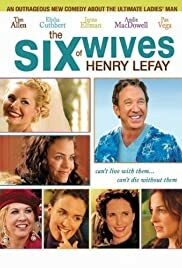 In my opinion, "The Six Wives of Henry Lefay" rates a solid 6 1/2 stars. While I wasn't doubling over with laughter through the entire movie, the time I spent watching this crazy family go nuts and enjoying my bowl of ice-cream was thoroughly entertaining. Yes, Henry is an unconstrained libertine with the social IQ of a 13 year old boy. He races through relationships so fast that he doesn't even take time to glance back at the trails of tears for which he is responsible. In fact, his little boy affect is probably what keeps the women in his wake from killing him. Once connected to him, they stay connected, even burdened with their pain and anger. His daughter, Barbie, has been dealt with by him in a very similar vein. Yet, she, along with his suite of sweets, his collection of coquettes, has his back in time of need. WHY!? Another reviewer questions why any woman would fall in love with Henry. My response to that is, "Why did Laura Bush fall in love with George? Hillary with Bill? Me with my first husband? We don't need a reason. We just do it! Maybe we are looking for our father-figure, who, by-the-way, we had no part in choosing in the first place. Since we don't have any part in picking them, our father can be the last man on earth we would ever think of dating, and yet there we go, marrying them! What is there to say? Either d-i-v-o-r-c-e or long-suffering, pretty well says it all! This movie has been widely panned, criticized for lack of depth(?) as well as character development. After seeing some of the very popular movies in the 'comedy' genre currently, I am surprised that these are even requirements. In my opinion, many of us watch certain films simply for entertainment value. Furthermore, are there not endless numbers of variables in our lives that bring humorous connections to various story lines? "The Six Wives of Henry Lefay" was funny, relevant (believe it or not), sweet, and a bit odd. I found myself thinking, were I in this the same situation, I might have shot the guy! But this is not the first movie of its kind. "The Six Wives of Henry Lefay" is a contemporary screwball comedy reminiscent of the fun and warm films of early 20th century such as "Bluebeard's Eighth Wife" with Carey Grant and Claudette Colbert. A man with faults, people who stick by him, lots of laughs, redemption and a moral delivered at the end is the recipe for a very nice movie night at home for the right audience.